I think someone should challenge prison companies on those contracts with municipalities. Nobody has to honor a contract that requires the signatories to do something illegal. For years, prisons have been kept full by illegal means: 1) health discrimination against the mentally disabled; 2) racial discrimination against black, brown, and red people; 3) depriving defendants of adequate defense and due process of law; 4) over-sentencing; 5) corruption in the court process, such as prosecutoral misconduct, etc. A contract that is "void" cannot be enforced by either party. The law treats a void contract as if it had never been formed. 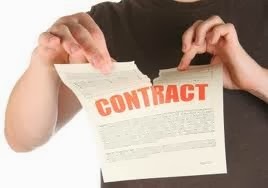 A contract will be considered void, for example, when it requires one party to perform an act that is impossible or illegal. Your contracts to keep prisons at a certain occupancy level despite dropping crime rates should have no more validity than a contract between pimps to respect each other's territory. The American people await the first municipality to stand up and say "NO. I will not honor that contract. It requires us to engage in criminal activity against our constituents, and we are not bound by law to respect it." Demand a jury trial, and you will win. Once one city breaks contract with private prisons and jails on the basis that fulfilling the contract requires RICO Act Racketeering, violations against Americans' constitutional rights, and discrimination against people based on race and health status, slavery will end. Taxpayers will save many billions per year that are presently spent railroading innocent people into prison and keeping rehabilitated prisoners beyond their minimum sentences. These occupancy levels can only be honored by victimizing "the least among us, His brethren." IF I were an attorney, I would research the law and present the proposition of breaking contracts with private prisons to city councils, county commissions and state governments all over America until I find one who is sick of paying prison companies for empty beds and willing to fight prison investors in court.